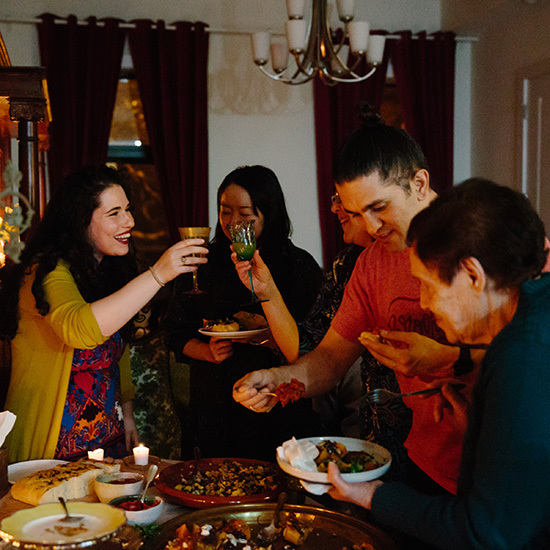 The harissa masters of NYShuk, Leetal and Ron Arazi, host family and friends for a beautiful Moroccan-style Hanukkah feast. 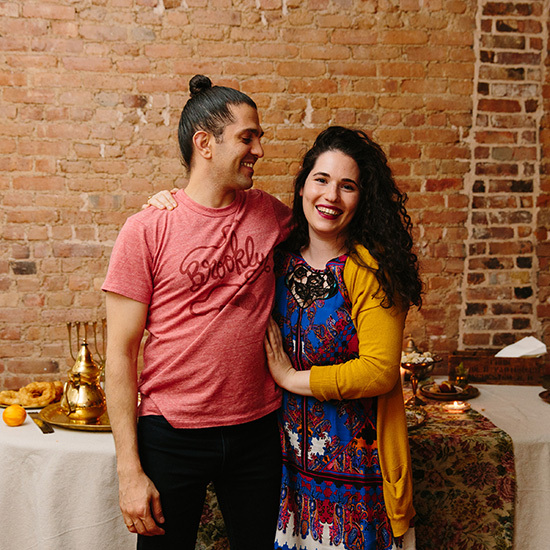 Leetal and Ron Arazi of NYShuk make incredible artisan harissa. Watch how they make it! 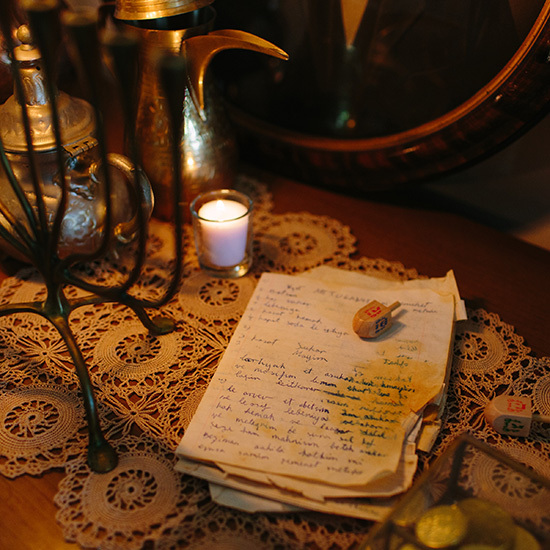 The book of recipes belonging to Leetal’s grandmother, Rika. 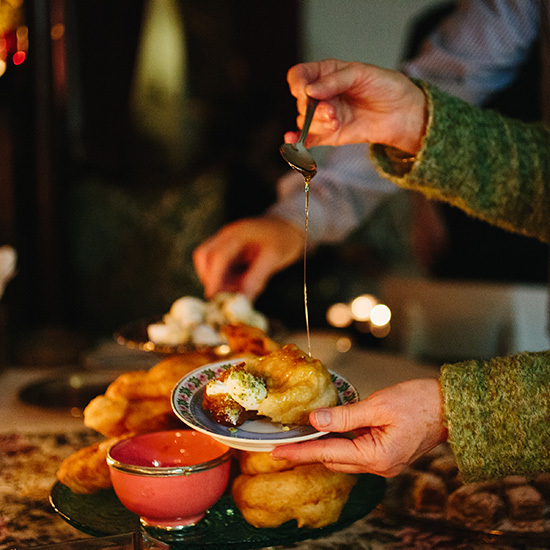 They used it to make ekmek kadayıfı, cream-filled doughnuts that are topped with chopped pistachios. 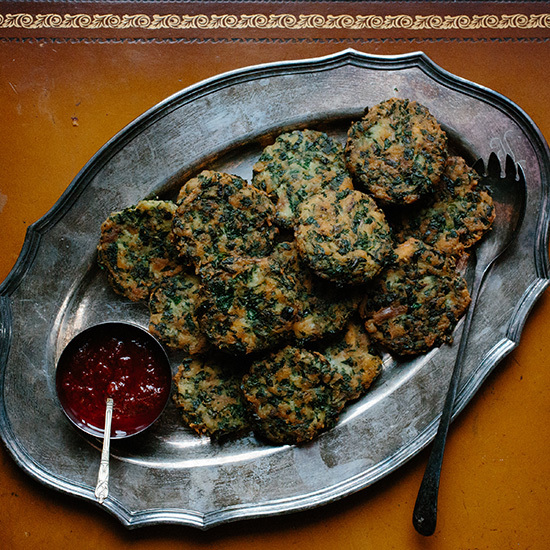 Chicken levivot—fried, spiced and herbed shredded chicken and potato cakes with harissa dip that’s made by mixing NYSHUK harissa, oil, garlic and lemon. 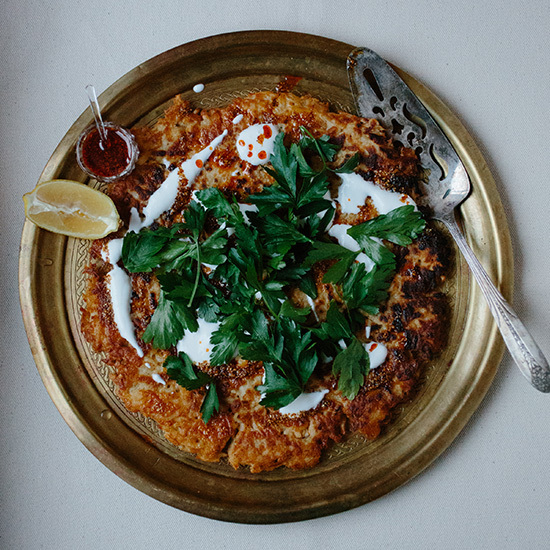 An oversized Jerusalem artichoke latke topped with parsley, yogurt and l’ekama, the aromatic spice mix Ron and Leetal make at NYSHUK. 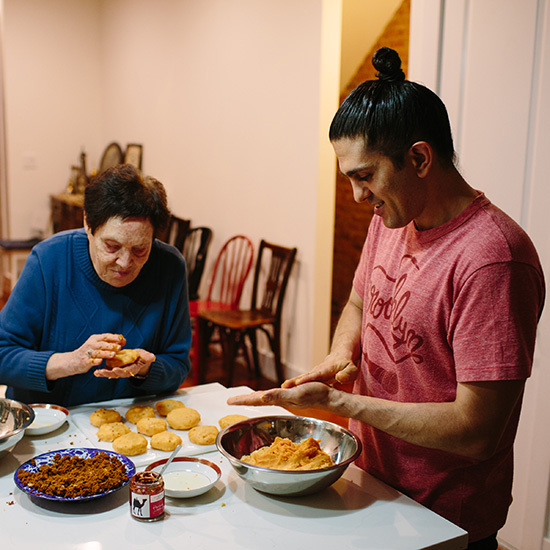 Leetal’s grandmother, Rika, and Ron forming popletas, harissa-flavored potato dumplings filled with meat. Rika’s knowing hands forming popletas. 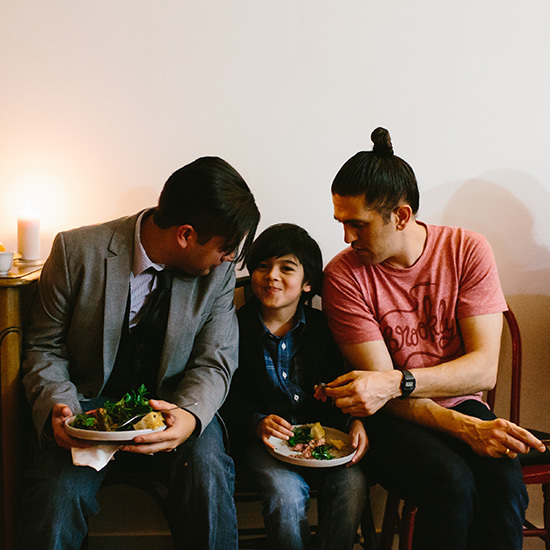 The couple’s good friend Kiko with his son, Lucas, and Ron. 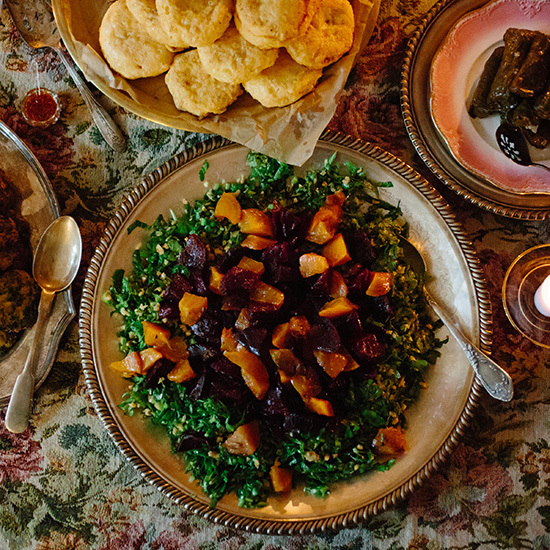 Charred beet and herb salad. Leetal, friends Shino and Cynthia, and Ron with Rika, toasting the holiday. 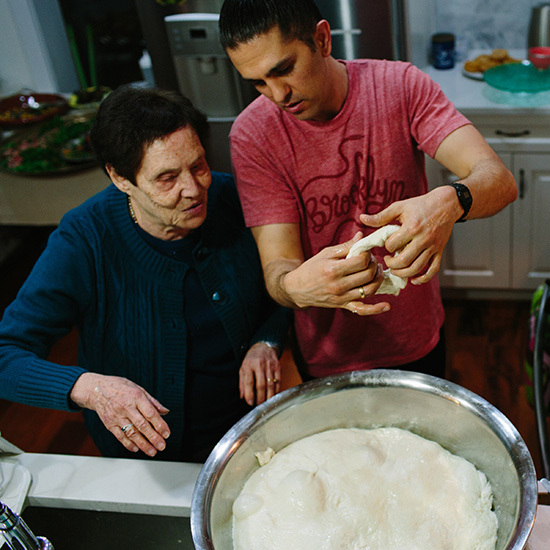 Ron showing his grandmother-in-law Rika how to make Moroccan doughnuts called sfinj. 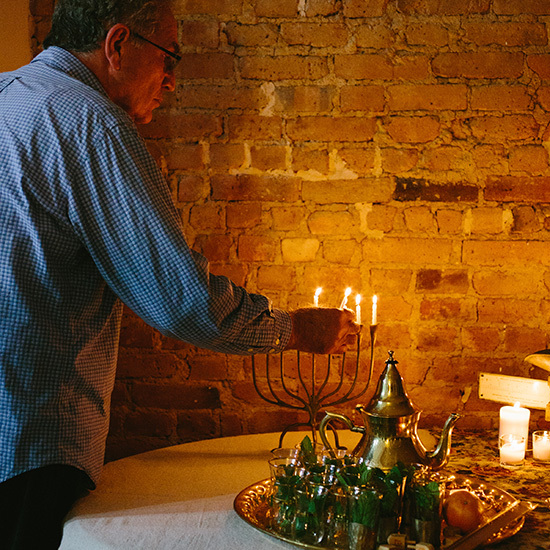 Leetal’s father, Shimon, lighting the menorah. 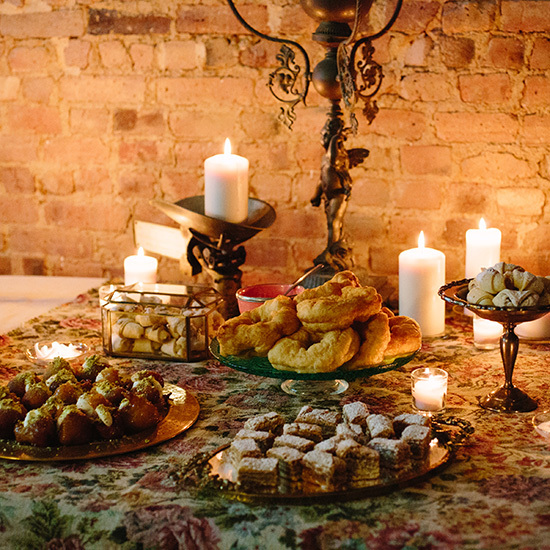 The dessert table, aglow. From left, Moroccan doughnuts (sfinj), cream-filled doughnuts topped with pistachios (ekmek kadayıfı), coffee meringue layer cake and walnut cookies. 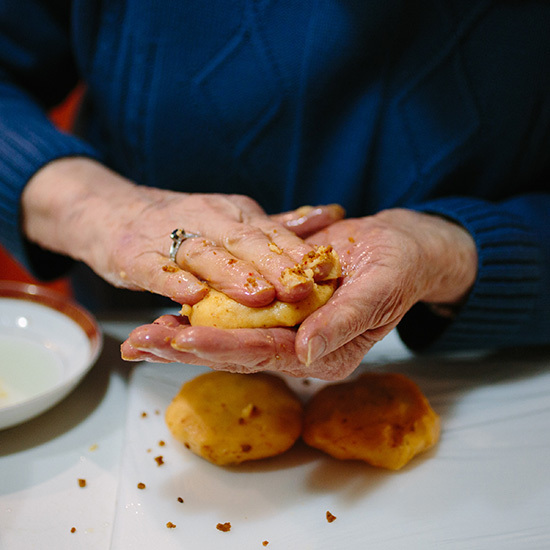 Drizzling the Moroccan doughnuts (sfinj) with saffron-cardamom sugar syrup. 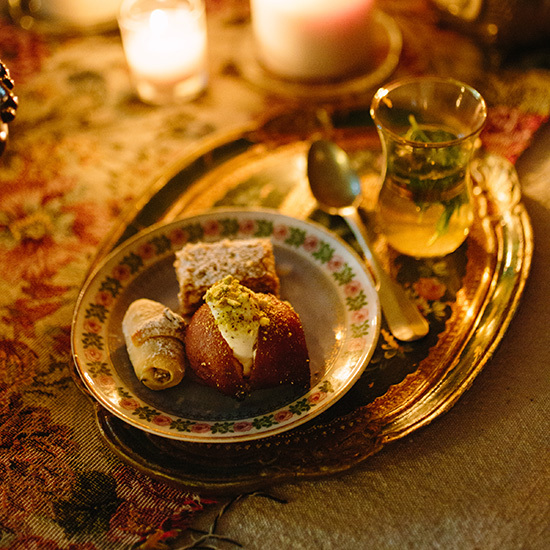 Dessert plate: mint and sage tea, the cream-filled doughnuts with pistachios, coffee meringue layer cake and a walnut cookie.